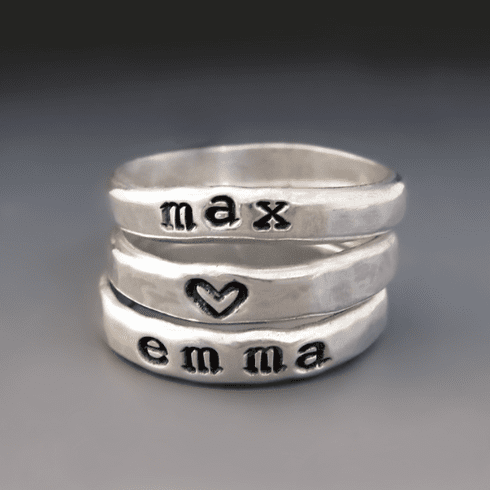 Give the perfect gift of love with these sterling silver personalized rings. These stacking rings are hand-molded and hammered to create a lovely organic shape and feel. This listing is for THREE rings: Two rings can be personalized with your choice of names or words. The third ring is hand stamped with a tiny heart. When wearing thick band or several stacking rings, they will tend to fit tighter than your typical slim band. For comfort sake you may want to consider MOVING UP A HALF - TO A FULL SIZE from your normal ring size. The more rings you stack the tighter they will feel. These Sterling silver rings are given a hammered texture and polished to a high shine. The hand stamped band rings are approximately 4 mm wide.